I met Julia earlier this year. 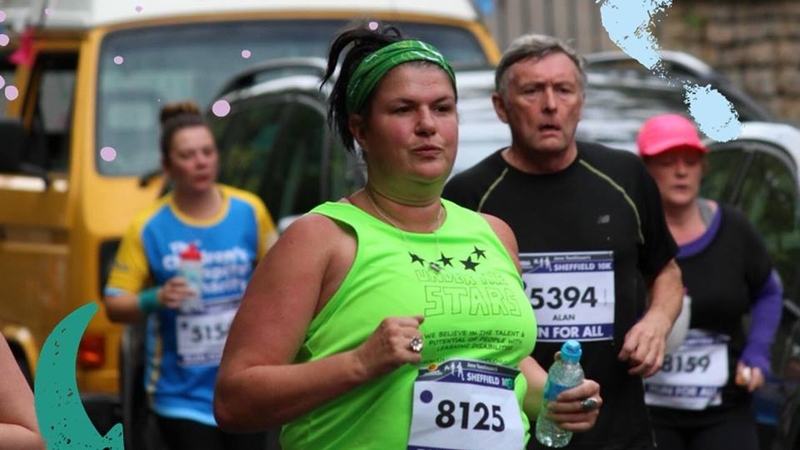 She had signed up to the ‘Couch to 5K’ programme and had made great progress, but then picked up an injury when training for her first 10k race. We sorted out the problem and Julia went on to successfully complete her 10k debut and is now planning her first half marathon. I asked Julia whether she would be happy to provide a reference for me. I was expecting a few lines, but instead I received the following, inspiring story. With Julia’s agreement I have added this as a ‘guest blog’. On 1 January 2018, I donned a pair of trainers for the first time in many years. In the previous October, I had seen a poster in my local Mind charity shop for ‘RED (Run every day) in January’ to help mental health, and thought it had to be worth a try. I signed up on a bit of a whim, as I had been really struggling with anxiety and depression, and my body image was at an all time low..... plus it was a long way to January. I had just been referred to South Yorkshire Eating Disorders clinic to get counselling support around binge eating, which was my coping mechanism for feeling bad. Of course, it just made me feel worse and the cycle of failure was breaking me. On that freezing day on 1 January, I got an email from ‘Red’, encouraging me to get outdoors as I’d feel so much better. It was a bit of an effort, and my family thought I was mad....but I huffed and puffed for about a kilometre round the dark streets....and I didn’t die! I continued my little challenge to myself every day and strange things started to happen. I began to feel better, to feel proud and to retake control of my life and my eating habits. I stopped hating myself. I began to feel a new sense of power ......and it was awesome. The more I got of this new wonder drug the more I wanted. I was giving running everything I’d got. I completed a wonderful Couch – 5K course, and quickly progressed onto a 5-10K course which was much harder. I felt strong and capable....... ...but sadly I wasn’t strong enough. I picked up an injury in May time after I’d run a series of short races, and I was in way too much pain to run. This felt like the end of the world. I spent hours and hours on the internet trying to diagnose myself and get opinions from my new found running friends. Of course, everyone had a different opinion about what could be wrong, and so much conflicting advice was only making things worse. Our amazing running coach from Couch – 5K suggested I visit Kim Baxter to get a professional opinion. As soon as Kim greeted me in her office I knew I had come to the right place. I was pretty petrified sitting in the waiting room .....this was a place for ‘proper’ sporty people, but her big smile when she came out of her treatment room put me right at ease. We chatted a bit about the pain and how I felt, and within minutes she had identified that all the internet advice I’d been getting was wrong and diagnosed the real problem! She listened to my anxieties about how my mental health would suffer without running and she completely understood. She explained that pain can feel worse when we focus too much on it, as the brain sends lots of messages to the injury so it’s all you can focus on. By worrying so much that I wouldn’t be able to run, I was possibly hindering my own recovery. It was time to get on the treatment table and get some much needed sports massage to try and release some of the tension in my lower body. This was pretty mind blowing in how much she could achieve within a short time. My right hip wouldn’t extend one inch when she started, and it was almost totally free by the time she finished. She then gave me the best news I’d had in two weeks, I had to go for a ‘baby run’ that very night; taking tiny steps for no more than ten minutes, and to repeat this for the next week. She also gave me some gentle exercises to help with the pain. After a week things felt better so she assured me I just needed to keep going with the exercises and I probably wouldn’t need further treatment. I’m very happy to say that within 3 weeks I was fully recovered, and better than that, I hadn’t needed to take a long gap from my running. I ran the Sheffield 10K in September and am aiming for a half marathon later in the year. I have sent three of my friends to see her already and couldn’t recommend her highly enough, not only for her expertise but because she is so approachable, understanding....and most of all kind. Thank you Kim, you’re a lifesaver! If Julia’s story has inspired you to start your running journey then here are some of the groups available in Sheffield to help. Couch to 5K group with two courses per year based at the Umix Centre near London Road. Also a great hub for advice and support from others. Wednesday evening group with a meeting point of Falkland House Surgery. Or try doing it yourself with this 10 week program.